The legend of Boabdil, the last King of the Moors of Granada, is still alive. After the Christians conquered the city in 1492, he was banished into exile. At a certain point from the city, he turned around to take one last look at his beloved Granada, sank his head and began to weep. In that moment he remembered his mother's words, do not cry as a woman for something that you were unable to defend as a man. Anyone who has visited Granada at least once can understand Boabdil because the atmosphere of Granada is fantastic each and every day. Granada is a scenic city at the foot of the Sierra Nevada, a relic of a thousand and one nights. The warmest coast in Europe, the "Costa Tropical" can be reached within 45 minutes. The highest mountain of the Iberian Peninsula is also at an arm's distance. Granada, the cradle of the most diverse cultures, was always a beloved city. Romantic 19th century intellectuals lived here, as well as the ancient Greeks, Romans, Phoenicians and the Moorish. Granada is certainly the city in Europe with the most evident traces of the Moor empire. The majesty of the Alhambra Palace dominates the city. The Albaicin, the gypsies' quarter, the Sacromonte with the small rebuilt pubs and Flamenco stages are all witness to a lively past. For centuries Granada was ruled by many Caliphs and dynasties. This has left a strong imprint on the architecture and adds to the magical fairy-tale atmosphere. Granada was the last stronghold of Islamic Spain and the Arabs finally succumbed to Isabel and Ferdinand (the catholic monarchs) in 1492. The Muslims and the Jews were forced to leave the country or convert to Christianity. At the same time Christopher Columbus came to Granada to ask Isabel and Ferdinand for a grant to build ships. They gave him the money and surely, you already know the rest. However, Granada is not just history. The "Granadinos" say that what counts is now. Granada is a lively university city with about 60,000 students which of course influences the vibrant nightlife and the advantage of being a language student is that you don't have to feel guilty when you are out enjoying yourself because meeting new people and chatting in Spanish is an important part of the learning process. There are plenty of terrace bars where you can have tapas as well as discos, bars with live music etc. The main action is centred around the streets "Pedro Antonio de Alarcón" and "Plaza Nueva". Our school is located in the very centre of Granada, only 5 minutes from the Alhambra. There are three floors and a terrace with a panoramic view over the centre of Granada. On the 2nd and 3rd floors there are fully-equipped apartments with kitchen, washing machine, sitting room, TVs, bathrooms and numerous bedrooms (free wireless internet access is also available). On the first floor there are some classrooms and a computer lab with free internet connection. On the ground floor is the Course participants come from around the world. "Spanish4you: Specialists in Spanish Courses in Granada. 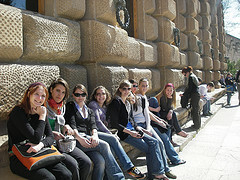 Learn Spanish in Granada with activities and accommodation. Spanish4you offers you every kind of Spanish Course in Granada."